Presently, there are numerous events transpiring which are said to be linked to a coming, monumental transformation here on Earth, as well as within our entire solar system and beyond. According to the Law of One text, this transition is to fundamentally change the entire structure of life, matter, consciousness, and energy as we know these to be. My intent within this article is to explore the clues we are given within ancient texts, and to compare them with recent articles published by David Wilcock and Dr. Michael Salla on the latest intelligence from the Secret Space Program insider, Corey Goode. 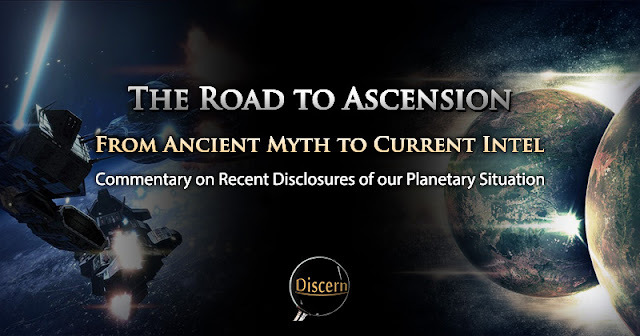 The concept we refer to as ascension holds its origins in numerous ancient texts and myths which do not receive much credit within modern, corporate media. In fact, anyone who suggests that these texts may be more than religious belief systems or a nice bedtime story is instantly ridiculed and degraded by the mainstream simply for offering an independent thought. To add to such insults, these skeptics are typically parroted by those who desire nothing more than attention, and who want to be seen as "intelligent" by their pseudo-skepticism. However, we are here with a different purpose. The recent article by David Wilcock, Full Disclosure and Ascension: The War has Gone Hot! (Parts 2) revealed some extremely interesting intelligence on current, planetary developments toward freedom and ascension. Lets examine. The following comes from the fourth page of the article entitled, SECTION FOUR: THE WAR. The ETs have told us that "we" are responsible for defeating the Saurians. It cannot be done for us by outside ET groups. It is our responsibility. Multiple insiders, including Tompkins, have confirmed this is the case. However, the only "we" here on Earth who have sufficient technology to do this is the military-industrial complex. Many of them do NOT like the Draco at all. The Draco see the handwriting on the wall and know the end is in sight. The sun is going to go through an energetic change that will likely destroy them, but will have marvelous effects for the "authorized" human life here on Earth. This change is very thoroughly examined, in unprecedented detail, in The Ascension Mysteries, only two months from now. The vast majority of the Draco will be defeated when this event happens. They know they cannot be here for it. I am glad to see this information coming forward. It's always good to see confirmation of intuitive hunches in this form. It serves to reason that if this universe is foundationally positive, then no group would be allowed to commit multiple millennia worth of crimes against the planet, and then just pack up and leave. The way I see it, if they can stay for the party this long, they can stay for the clean-up afterward. Now, lets examine the details of this successful repulsion. Let's take a look at a few more details on this attempted, Draco retreat. THE ARRIVAL OF THE "CHEVRONS"
The Draco are now trapped in here by the Outer Barrier. The no-fly zone around the earth was temporarily dropped after it started, to set innocent ET groups free, but it is essentially back again in a new form. 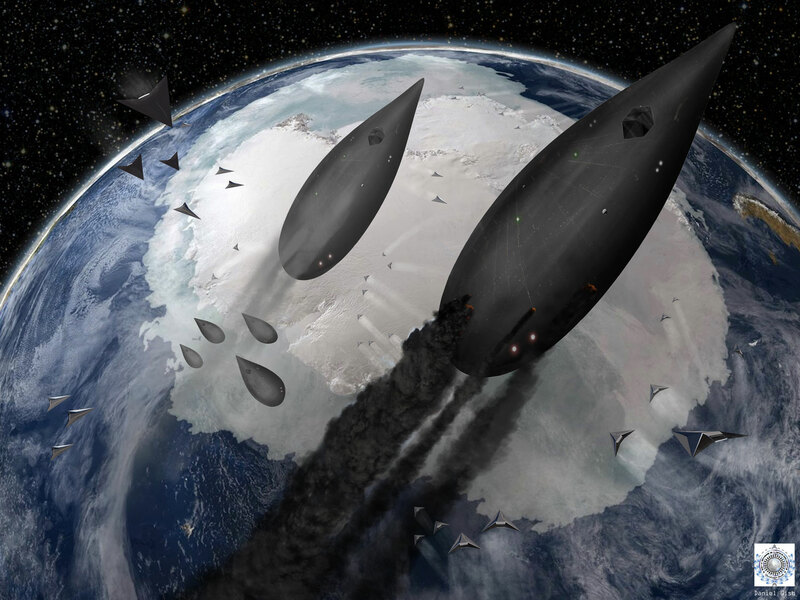 The Draco recently tried to flee the Earth from Antarctica in six large teardrop-shaped ships. They likely had high-level Cabal people inside with them. Something incredible happened. 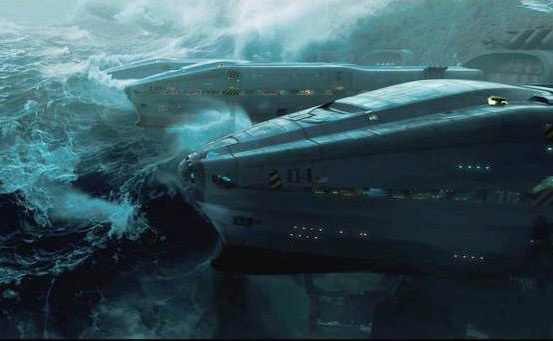 Brand-new triangular-shaped craft, known as "chevrons" due to their interesting shape, suddenly popped up. This is the critical intel I was supposed to have disclosed at the end of April, and got in serious trouble for sitting on for so long. The chevrons were extremely effective at shooting down the Draco craft. This has been a tremendous game-changing event in this war. Corey's people in the SSP Alliance did not know who built the "chevrons". It appeared to be one of the Earth-based "lower level SSP" groups. In order to give them honor and respect, I will refer to these Earth-based space program groups as the military-industrial complex, or MIC. All the SSP Alliance knew was that they were seeing a dramatic "surprise attack" with a new weapon that no one, including the Draco, knew had existed. Its effect in military history was equivalent to the discovery of the crossbow or gunpowder. The superior weapon wins the war. It's a classic story. It just happened again. This epic defeat and cornering of the Draco has huge ramifications for the future we will see unfolding on Earth. Somehow the MIC managed to make a huge quantum leap in their level of technology, sufficient to take out the Draco. These new MIC "fighter jets" were apparently created in two places by Boeing and possibly other contractors. This includes the Skunk Works in Palmdale, and another facility at China Lake in the Mojave Desert. The underground facility at China Lake is big enough that with the right equipment, it looks like a city of 500,000 people at night. These new, stealthy-looking black triangle craft can fly along normal jets and airliners completely unseen and undetected. They apparently have a rounded area at the front that forms a cockpit. Their total size is approximately 90 x 90 x 90 feet. 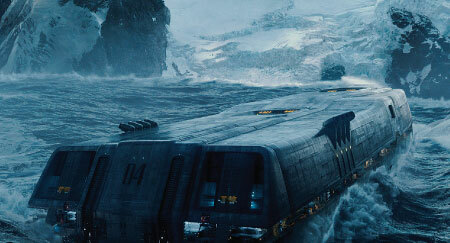 They are powered by a mercury centrifuge that generates antigravity and propulsion. They can turn on a dime at Mach 17 and it doesn’t hurt the people inside. These capabilities did not exist for the Earth-based MIC space program groups before, running through the DIA and other such organizations. Peterson knew all about these triangle-shaped craft when I discussed it with him on the phone. The MIC are very proud of their new weapon. It is very likely that the MIC got this technology from Alliance defectors from the space-based ICC, or Interplanetary Corporate Conglomerate. The ICC is a faction of the SSP that started out as a part of the MIC. The ICC then became far more powerful and splintered off in various off-planet colonies. This group is completely self-sufficient, never needs money or supplies of any kind from Earth, and is effectively a breakaway civilization. The craft piloted by the earth-based MIC were nowhere near as advanced as those of the ICC or Dark Fleet, but all of that has changed now. The accounts of these events may seem alien to many of us. However, these accounts may have been well documented within ancient myths from multiple countries around the world. It is my belief that as these ancient texts describe 'gods' fighting one another in the heavens, they were actually describing spacecraft battling in the skies above them. The Temple of Edfu (Temple of Horus) is said to be a treasure trove of knowledge, and to hold recorded history of the world from ancient times. 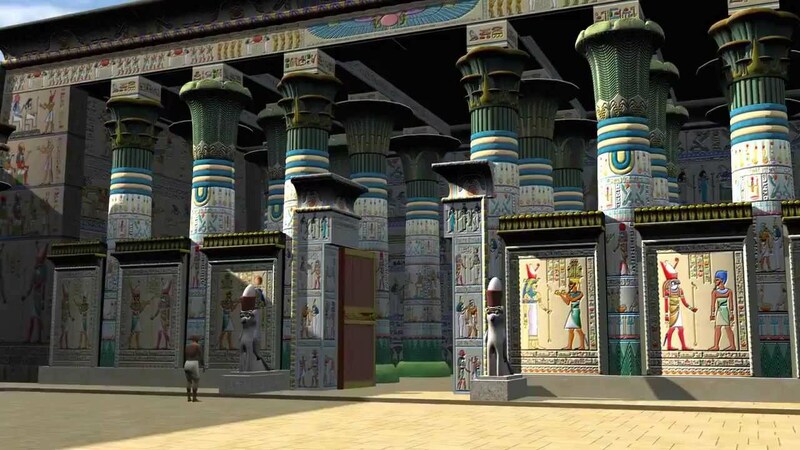 Hieroglyphics line the walls of this great temple and reveal an account which many "alternative" historians consider highly accurate. Much of mainstream archeology writes these records off as myth and legend. However, this is not the way ancient Egyptian scholars viewed these records. One writing on these texts comes from the website, Sacred-Text.com. This is a site dedicated to preserving ancient texts of various religions and philosophies from around the world. Here is an excerpt describing one of the stories depicted on the walls of the temple of Edfu. In the 363rd year of his reign Ra-Harmakhis 1 was in Nubia with his army with the intention of destroying those who had conspired against him; because of their conspiracy (auu) Nubia is called "Uaua" to this day. From Nubia Ra-Harmakhis sailed down the river to Edfu, where Heru-Behutet entered his boat, and told him that his foes were conspiring against him. Ra-Harmakhis in answer addressed Heru-Behutet as his son, and commanded him to set out without delay and slay the wicked rebels. Then Heru-Behutet took the form of a great winged Disk, and at once flew up into the sky, where he took the place of Ra, the old Sun-god. Looking down from the height of heaven he was able to discover the whereabouts of the rebels, and he pursued them in the form of a winged disk. Then he attacked them with such violence that they became dazed, and could neither see where they were going, nor hear, the result of this being that they slew each other, and in a very short time they were all dead. Now by some means or other Set came to life again, and he took the form of a mighty hissing or "roaring" serpent, and hid himself in the ground, in a place which was ever after called the "place of the roarer." The point of the "place of hissing" or "roaring" is also worth considering. Here, we have an account of these gods battling, and due to the strength of the forces of Horus (a bird-like humanoid), they were able to drive the forces of Set into the ground. I find it particularly interesting that Set "took the form of a snake", and that the place to which he retreated underground (along with the survivors among his army, most likely) is referred to as "roaring serpent". If these forces were observed to be snake-like E.T. 's, this may have been a key point, as this battle may represent a time when the Draco were driven underground, and according to the account, they were not seen again (at least by the time the account was inscribed). When considering these records, or any record of ancient Egypt, it may be important to consider a few factors. The first is that, according to the Law of One text, the actual group which called itself "Ra" was a benevolent group which first brought the pyramids to Egypt (around 25,000 years ago), and granted advanced knowledge to the people. However, each time these benevolent beings attempted to communicate with ancient Earth civilizations, those civilizations eventually perverted the message, and misused the technology. According to the text, Egypt was no exception to the misuse of the assistance from the Ra group. The people of Egypt would have multiple impressions and interpretations of the messages they received. Consequently, the ideas they formed afterward conflicted with one another, and they would eventually distort the message significantly. To add, the distortion of the message of the Ra group may also have been why we see Horus depicted as a bird-like being. I also consider the possibility that Horus was a human-E.T. hybrid, and that he was more liberal with the Law of Free Will than the actual Ra group. Horus is depicted as a blue, bird-like humanoid, which may be indicative of his mixed genetics. It is because of these possible distortions that I tend to take the Edfu account with a grain of salt. To restate, these records can be very helpful in revealing historical events, but it is always a good idea to gain an alternative perspective on the matter from reliable sources before attempting to draw any conclusion. When considering the present-day intel coming forward from Pete Peterson, Corey Goode, Dr. Michael Salla and others, the account of Edfu paints a particularly interesting image of possible, past interactions with these Draco beings. Lets bring the clock forward to the beginning of the current ordeal, so as to gain perspective on the situation, and how events have progressed to this point. For those who have read Dr. Michael Salla's report on the numerous disclosures from Corey Goode, this will be a review. However, this information is key for gaining perspective as to why the cabal and Draco forces were so anxious to escape. Here is Dr. Salla. I find that Dr. Salla gives a unique perspective into the situation, and is careful to provide detailed background to the current state of affairs. I find this account to be a fitting compliment to the intelligence from David Wilcock. Wilcock often provides helpful, multi-perspective accounts of each situation about which he discloses. For the purpose of further confirming, here is another excerpt from Wilcock's latest article on the cabal's attempt to run out on their check. Pete confirmed there was a shooting war over Antarctica, and that massive amounts of Cabal assets are being transferred there now. His briefing was that this transfer was occurring through many different C5 Galaxy craft. Each plane holds 500,000 kg, almost a million pounds. Corey's data is that there are massive submarine tanker ships doing this transfer as well. It is huge in scope. There are tons of data points we can see in the visible world that show the Cabal is about to experience an epic defeat. That is why they are scrambling to move everything of value to a safe haven. 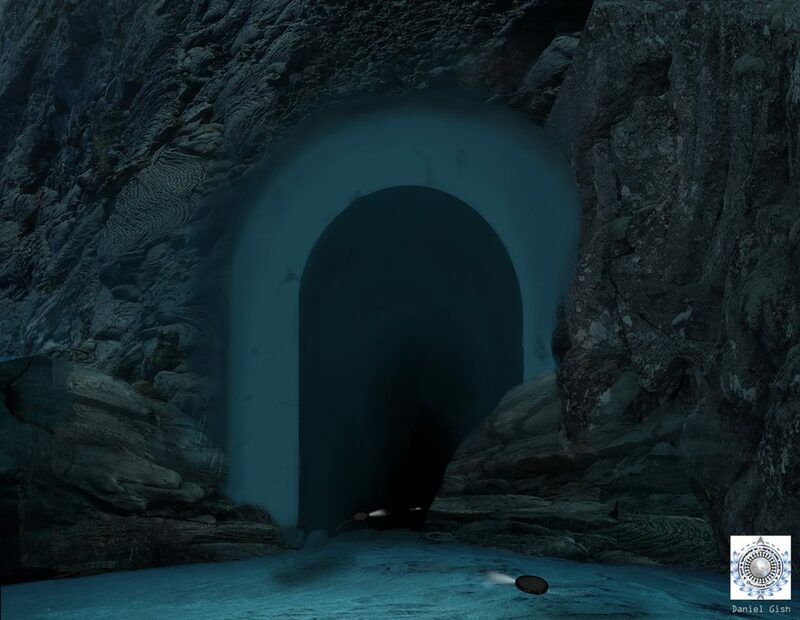 The tankers are moving through vast undersea tunnels that lead straight to Antarctica and were perfected and built out by ancient ETs long ago. 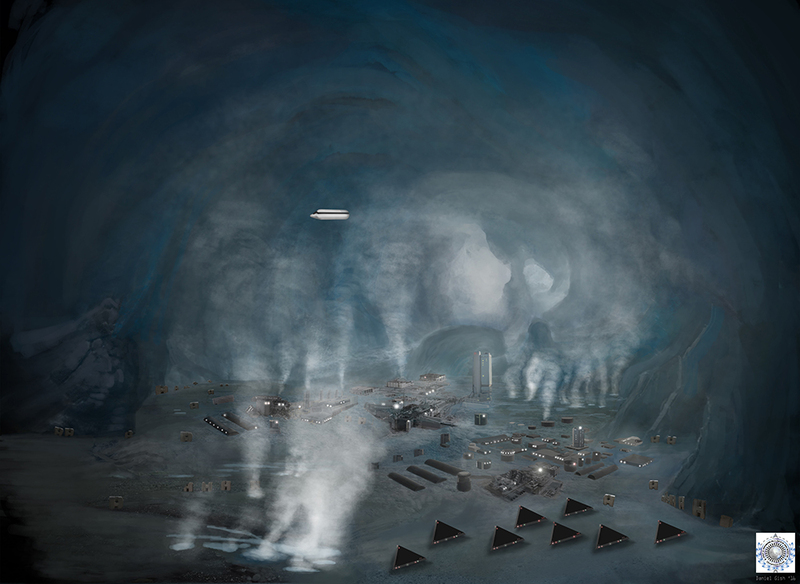 This next illustration is based on Corey's eyewitness testimony of seeing these massive undersea tunnels firsthand. The craft at the bottom are the gigantic "supertankers" that the Cabal is using to transfer all their assets to their last possible safety zone on Earth. David Wilcock's presentation on the matter was interesting. There are also a few details which Dr. Michael Salla included within his commentary which I found most informative as well. 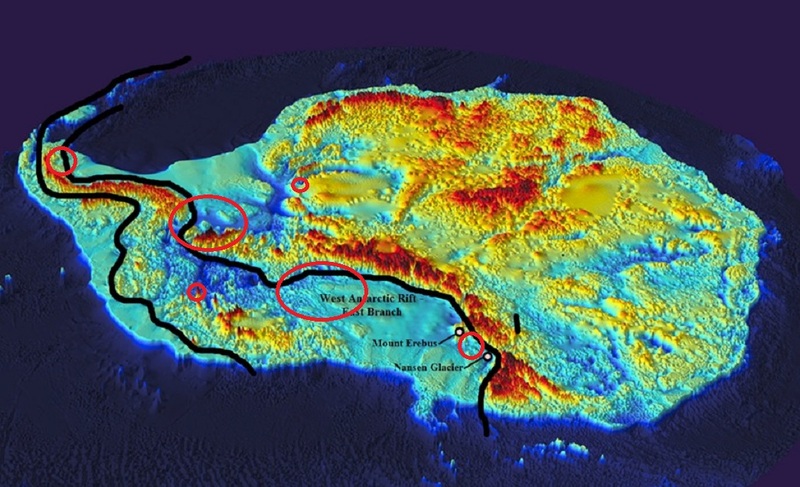 Here is an excerpt from Salla's recent article on the events in Antarctica. He provided an illustration for the location of these bases that he was personally taken to visit by the “Anshar” on May 14. Goode has previously described the Anshar as the oldest of the Inner Earth civilizations that he has met in secret negotiations – alleged dating as far back as 18 million years. The notion that these cabal forces are being so direct in their intent to vacate the planet may seem reasonable from their own point of view. However, the act does raise a few questions. For a good while now, I have wondered why the cabal seemed to be working on at least two visible fronts. We typically hear that they are in retreat on one front, and on another, they are still manipulating the banks, brainwashing the masses, and more recently, running for office. I once reasoned that there were some who chose to risk staying behind, and trying to maintain control while the rest of the cabalists skipped town, and possibly attempt to destroy the planet somehow. In a sick way, it makes sense that they were never planning on bringing their whole gang with them. They appear to have decided to let their lower ranks rot while the higher-ups skipped town. This act alone may give us a true picture into the mindset of the average cabalist. They seem to have little or no concern for the majority of their own people. For those familiar with past accounts of Corey Goode, this is similar to one he has shared in the past. This was an instance when one of the upper-class, Draco royals basically offered up the entire Earth-based cabal on a platter (along with all of their lower-level Draco ranks) in exchange for letting them escape. This was a strange meeting between Goode and the Draco royal. As I recall, the experience of having a telepathic exchange with this particular Draco was not at all a pleasant one. Still the offer was heard (and rejected). It appears that my initial impression of the situation was correct in this case. The Draco seemed to be desperate to escape back then, and are now on the loosing side of a war which has partially stemmed from long-running tension with the MIC forces. It appears that they saw this coming, and were afraid even back then. This evacuation/escape from their inevitable defeat seems to represent the hope of this crumbling cabal. Aside from their failed (and sic) dream, lets take a look at more of the reality they are experiencing instead. In addition to the battle we are seeing in the skies, and the possibility that these "fireball" events are UFO crashes, battles are occurring underground. Entire underground cities are being completely wiped out. When this happens, suspicious earthquakes occur. Benjamin Fulford covered this about a month and a half ago with unusual earthquakes that happened around Japan. These apparently were only a few of the attacks that became visible to us. The Cabal is also suppressing information about these attacks by modifying earthquake data from the USGS. They do not want us to see quakes that are at a magnitude of 6 or higher and are very close to the surface, as it makes people ask too many questions. Corey got pulled out for his most recent meeting with the Blue Avians at the exact minute that a large earthquake occurred here in California. It is entirely possible that this was deliberately timed with yet another underground base being wiped out. This subject of earthquakes brings to mind the observation of one well-known, Youtube personality who goes by the name, Dutchsinse. For years now, Dutchsinse has been publishing quality earthquake reports, recording and documenting weather anomalies, and has even developed a means of forecasting when and where earthquakes may occur. According to the USGS, and other seismological reporting agencies, it is "impossible" to predict these seismic events. However, Dutchsinse has been successfully proving the USGS wrong on this count for years, and needless to say, they don't like it very much. There is a reason I mention this method. One of the main trends we will find with the occurrence of seismic events is that many of these earthquakes begin deep underground. These deep quakes then result in more shallow quakes closer to the surface. Dutch has also observed many of these earthquakes clearly being seen on the USGS feed, but a few days later some of these quakes will have mysteriously disappeared from their records. By my observation, this confirms the USGS's tendency to cover the tracks of those working behind the scenes whenever it serves secrecy. Lets keep digging. This next portion of David Wilcock's article includes a few of my favorite points, and the subject which I consider most important for each of us. This war very likely now includes craft from warring factions physically breaching the boundaries of their enemies' underground cities. It does appear that the "good guys" have technology that can defeat the Saurians and other such negative groups, and a massive clean-up is going on. Another key issue is that the Draco have technology that is holding back the natural energetic shift we are going through here on Earth. This includes huge "tankers" that are in low-earth orbit, beaming out frequencies that scramble our ability to integrate this new energy from the sun. There are other systems both inside and off of the earth that are causing this scrambling effect to occur as well. With technology like the new "chevron" craft, the MIC / Earth Alliance could now shoot down the tankers and destroy the Draco mind-control grid. However, this would cause us to very suddenly be propelled into a consciousness shift. At first, this could be akin to the feeling of a psychedelic trip. Although this would cause people who are already advancing spiritually to develop even more, negative people would have extreme difficulties with it. This could lead to outbursts of violence, aggression, self-harming behavior and other types of powerful mental illness. It does not appear that there is any way to gradually turn off the Draco grid. It's either on or it's off. There's no fader dial. There is deep concern about doing this, even though they now have all the tech they need to do it. My vote is "Go for it." This is part of the Ascension. Yes, some people will freak out, but this will be balanced by the positive benefits others will have, which will enable them to calm everybody down. The point of shutting down the grid is one of the most important aspects of this account, in my opinion. These tankers would represent the entirety of human growth potential, or at least a good majority of it. If this technology is truly hindering human growth, and it is left up and running while the various SSP groups sit back and do nothing to shut it down, this could do more harm than good. If our solar system is constantly being upgraded to higher energetic states then that means the longer we wait, the more difficult the adjustment will be when the grid is turned off. Leaving this control grid up may keep things level, yes, but if there is no dimmer switch, that means that there is only one option. Trying to invent another control system with dimmer switch included does not seem like a reasonable plan, as such an invention would take far too long to design and construct. Plus, there would be the temptation for other parties to attempt to adapt it to their own advantage, and to possibly claim to turn it off, while keeping it partially operational. If "Off" equates to our freedom, in my opinion, "Off" it must be. This evolutionary process is the natural course of the universe, and we won't get anywhere by maintaining artificially-limiting control mechanisms. On the path of ascension, there are typically challenges we will face. We may suffer in different ways without realizing the significance, and in the moment, the experience may seem pointless or unfair. However, there is always a higher lesson to these difficulties. Let's take a closer look at this matter. This next portion was a bit difficult to hear, as there seemed to be no way of avoiding the situation which brought on this particular ordeal. Once again, here is David Wilcock. Corey did forget one of the most significant steps that had happened until it was later brought to his attention. A tablet was placed in front of him that apparently had a camera that followed his eyes. Corey was shown a long series of pictures of military personnel, like what you would see when they had first graduated from the Academy. Some of them were military. Some were wearing suits like from intel organizations. They were mostly Air Force and Navy. Apparently, in that drug-induced haze, Corey's pupils slightly dilated when he saw the faces of people he knew. His eyes identified and "outed" three people, one of whom was Gonzales. This caused a major rift with Gonzales that developed soon afterwards. Another of the three got killed and the other likely had to go into hiding. Remember -- the SSP Alliance members are all known to the Cabal portion of the SSP. They have had to do their work in secret. This event did cause significant damage to the SSP, and effectively fractured the trust and good faith with Gonzales, who is now in hiding. It was very rough for Corey to have Gonzales, his only real friend "on the inside," to turn on him. This included trying to prevent him from going along on meetings he had been specifically invited to, and effectively take over his role. Gonzales also spent an extended time in the inner earth, but was doing things like pacing out the facilities as a military planner and being deceptive. Gonzales was ultimately asked to leave and had to go back to an Alliance safety zone in the Kuiper Belt. He has since been taken away for healing by the Mayan breakaway group we have discussed on the show. He will not likely be seen again for some time. This has created a critical problem -- a breakdown in the SSP Alliance's ability to liaise with Earth Alliance groups and confer on valuable intel. That was why it was so urgent that we get this seemingly crazy-sounding information posted on the internet. The whole climate is so deadly now that no one from the SSP Alliance dares try to travel around the Earth or communicate. Corey is still able to do so because of positive karma authorizing his safety. Nonetheless, the "karmic discharge" required has been quite rough. The account regarding Gonzalez was unfortunate to hear, to restate. Though it is good to hear that he is in a safe place, it is never easy to see friends or colleagues part ways under difficult circumstances. Over the passed few years, I have undergone a few difficult transitions myself. I have witnessed and been part of a few break-ups and fallings-out with family and former friends, and though I understand the periodic necessity to part ways with opposing personalities, the experience is not easy. However, this is said to be a vital step in the overall process of evolution of the human race. According to multiple sources, these times require our own individual souls to make choices as to what our next destination will be. Where we go and what we experience are completely up to our own choice, and it is because of this individual choice that many people may part ways in one way or another. If two souls have chosen different paths, circumstances may develop which will allow them to have the experiences they desire most. A while back, I wrote an article called Wisdom Teachings with David Wilcock - Prepare for Ascension. This article included commentary on the pertaining episode of the Gaia series Wisdom Teachings. It also detailed the concept of one particular choice we must make in order to progress, according to the Law of One texts. This choice could be likened to one between self focus and community focus. Here is an excerpt from that article in the section titled, The Time to Make a Choice is Now. This brings up a very important issue which affects each one of us, as specially those within the truth community. This is the point of the responsibility of choice between the positive and the negative paths. The responsibility to choose a polarity is a necessary step within the evolution of every being. According to the Law Of One, this choice is one of the main reasons 3rd density exists. This density is the first point at which a soul begins to gain greater potential in power and ability, but a soul cannot do this unless they choose a polarity. Without the initiative to make this choice, a soul will continue reincarnating in 3rd density until the decision is made. According to the Law of One, this present point in time represents the last of the Earth's time within 3rd density. After this point, there will not be a habitable 3rd-density for such beings to occupy on Earth. (Though those who have chosen the positive path will continue into a golden age of sorts.) Simply put, this is the final 25,000 years of the greater, 75,000-year cycle. Third density on Earth ends with this cycle. After this point, every soul who has not yet chosen a polarity will have to relocate to another 3rd -density world so that they can continue their lesson. This could likely mean that they will spend another 75,000 years reincarnating, experiencing suffering, slow-track learning, accelerated karmic repercussions, and the continuation of “the veil” all for the sake of momentary indecisiveness. So what is the solution? The solution is to pick a side, of course. On the negative/dark/service-to-self path, you will essentially be in the cabal pecking order. Anyone who actually knows what goes on behind closed doors among these people knows that this is not at all a pleasant experience (for most, though some may actually enjoy suffering). The first among the qualifications on this list is that you have to be 95% service to self. This means that a person needs to be all but completely devoid of the consciousness of love, compassion, forgiveness, affection, generosity, etc., as these are seen as “evil” among cabal. If a person meets these qualifications, there may be a place for them on the negative path. The next dark qualification a person must meet is that they have to agree to torture and murder (both the giving and receiving thereof). (This starts from a very young age.) These staples of cabal living are necessary for gaining power on the negative path. After a person has been sufficiently fractured and calloused by this torture (granted they survive), they are then ready to assume the lower ranks of a life of guiltless violence, manipulation, deceit, exploitation, murder, and of continuation of everything which they themselves experienced, all with only a faint hope of slowly raising through the ranks. On the dark path, this cycle never stops. (It actually only lasts until around 6th density, when many souls become tired of this path and choose love and light.) Though the dark path does end, it ends with the karmic balancing of the accumulated suffering an individual has inflicted upon others during their time on the dark path. Despite all of this, this path may still be attractive to some. Personally, I do not see any reason to continue suffering at the hands of those on the negative path. I see no reason to sit on a fence considering the benefits of either side without the mind to choose between the two. Nor do I see any reason to be tortured, manipulated, deceived, used and abused in the hopes that I will become slightly more powerful. Personally, the decision has been easy for me in life. I know torture all too well, and I am done with it. I was born for the positive path, and I intend to take my place on it. (As I understand it, according to the Law of One, this positive path is where every souls ends up anyway, but because of Free Will, there must be an alternative option.) I understand that this choice is not as easy for everyone as it has been for me. What I do not understand is how difficult it seems to be for so many people to tell which is which. There have been numerous times (more than I care to count) when I have witness those who believe themselves to be on the positive/light/service-to-others path who actively choose to follow overtly manipulative, deceptive, and exploitative sources for their guidance and information. For instance, there have been numerous times when I have witness seemingly reliable sources use age-old tactics of propaganda and deception in order to communicate a message of supposed light and truth. While these tactics are openly observable to anyone with the mind to learn, very few, if any, seem to notice. We can walk onto a used car lot and remember not to trust everything that we are told. We can watch a corporate advertisement and question and critique what we hear, but when it comes to Youtube or a favored alternative site, all critical thinking and deductive reasoning seems to go out the window. We observe this source and that source for reliable information, but when they begin to personally attack their fellow positive path/light worker, we don't mind at all. We will listen to anyone who seems to be speaking “truth”, but if that source begins to give absolutist, manipulative messages, many of us don't bat an eye, let alone notice. More often than not, we cannot tell the difference between the paths of service to others and of service to self. Along with this, I have seen multiple people claim to be giving me truth, but while doing so, behave just as rudely and manipulatively as any cabal member (nullifying the power of any "truth" they claim to be giving). This confusion of positive and negative paths seems to be running rampant within many awakened communities. Many of us have had years to wake up and start to function as aware individuals, but this opportunity to learn and discern seems to have escaped many of us. Those on the path of darkness always leave traces of their presence. These traces are either visible, audible, and/or legible. All that is required to see and to be aware of them is a decision to learn and to observe. Many of the trademark tactics of manipulation are quite literally centuries old. The reason they are still so common is that we keep falling for them. It is time to change this (for those who so choose). Those on the positive path honor the Law of Free Will. They do not attack (physically, verbally, or any other way, though they may defend), they do not manipulate, and they do no forced their belief systems upon anyone. These are definitive traits of those on the path of darkness and service to self. If we see any source using these in a way that might be accidental, it's important that we let them know, and encourage them to chose a higher means of communication (treating them as we would want them to treat us). If they habitually exhibit these traits in multitude, or if they make excuses as to why it may be necessary to manipulate and deceive, they have most likely chosen the dark path. The traits of love and light are obvious to those with open eyes. On this path, we will see compassion, forgiveness, generosity, love, self responsibility, sensitivity to the needs of others, and a general release of the egoistic need to be “right”. The service-to-other focus realizes that there is no difference between the self and the whole and therefor chooses to serve the whole. (Though this is not to say that the self is neglected.) It is on this path that we will reach our future golden age, though we must choose to experience it. The two paths are clear. All that is required to see them is the initiative to learn and observe, and the knowledge to discern. In this pursuit, we must remember that to awaken is only a first step. It is not enough to simply “wake up”. In order to actually progress, we must open our eyes and get out of bed. According to the Law of One text, we are all going in the same direction. We are evolving toward the same destination, and that destination is complete and perfect unity. So no matter how many separations we experience, we will all wind up together at some point anyway, and when we do, we will have grown, learned, and evolved in tremendous ways. This next section included some of my favorite intel from David Wilcock's recent update, and it discusses one of the main reasons of why our choice is extremely important at this time. Corey was brought up to the usual location for the Blue Avians. He is standing inside a sphere and sees the stars all around him. The floor he is standing on is a series of cris-crossing lines of white light in a square grid pattern. The Blue Avians, such as Tear-Eir, stand in front of him. The communication is telepathic and the sights are very interesting. He sees multiple spheres in our solar system, with a purplish or bluish color. These are normally cloaked and invisible to our own people, as well as the SSP, but within this area he can see everything. They are all arrayed in a vast gridlike pattern throughout our solar system. The first thing Corey noticed was that the spheres were far more active than usual. There were an ongoing series of energetic discharges passing between them. He was told that they were having to work harder to buffer the ever-increasing changes going on in the sun, as we get closer and closer to this event. 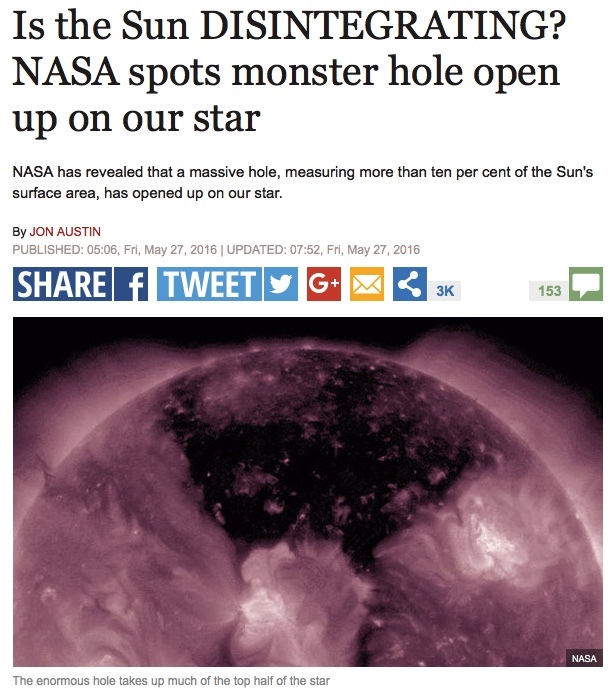 One visible sign of these epic changes was in what NASA called a "Monster Hole in the Sun" as of May 27th. In short, this "monster hole" is another sign of the ever-increasing pressure buildup leading to this mega-event. The spheres are dissipating the energy so nothing happens until our collective free will authorizes the change. The Blue Avians also told Corey that Gonzales hasn’t been ready to accept communication from them yet. He is still going through healing. Most interestingly, they told Corey these mounting solar changes are creating a rapid vibrational increase here on Earth. It is inescapable and is affecting everyone, right now. One major sign of the change is that it is causing people’s old karma to come up much more than usual. We were told that many people are going to start losing it, demonstrating end-time madness, nutty and crazy behavior. This is also affecting the SSP Alliance, causing them to become rash as they panic about the transitions we are going through. Furthermore, we were told that these energetic changes are soon going to reach a crescendo. Once this happens, massive numbers of people will start having ghost experiences from loved ones who have passed over. We will start receiving direct contacts of this nature, giving us inspirational information. Far too many will be experiencing it for it to be ignored. Once this happens, we know that we are close to some very major changes. We are then told to keep our eyes and ears open for more of the amazing stuff that we have been speculating about. This could include the open appearance of UFOs, a solar flash, and the resulting thinning of the veils between the physical and spiritual worlds. I asked Corey if we would develop telekinesis or actually experience Ascension, but this was not mentioned in his information-sharing. Much of the above material is in reference to an historical concept which is carelessly labelled 'mythology' by the mainstream. However, the current intel within the highly advanced, technical knowledge of the SSP (as well as the Law of One text) suggests otherwise. Many religious traditions throughout history have told of end-time scenarios, and in each account, there seem to be quite a few common factors. Here is another excerpt from my past article Wisdom Teachings with David Wilcock - Prepare for Ascension, on this subject of end-time scenarios. Below are passages from multiple ancient religions and cultures which all seem to make the same general assertions on the events which occur at the end of these 25,000-year cycles. And, monks, there comes a season, at vast intervals in the lapse of time, when a second sun appears. After the appearance of the second sun, monks, the brooks and ponds dry up, vanish away and cease to be. So impermanent are constituent things! And then, monks, there comes a season, at vast intervals in the lapse of time, when a third sun appears; and thereupon the great rivers: to wit, the Ganges, the Jamna, the Rapti, the Gogra, the Mahî,--dry up, vanish away and cease to be. Again, monks, when, after another long lapse, a fifth sun appears, the waters in the great ocean go down for an hundred leagues; then for two hundred, three hundred, and even unto seven hundred leagues, until the water stands only seven fan-palms' deep, and so on unto one fan-palm; then seven fathoms' deep, and so on unto one fathom, half a fathom; waist-deep, knee-deep, ankle-deep. Even, O monks, as in the fall season, when it rains in large drops, the waters in some places are standing around the feet of the kine; even so, monks, the waters in the great ocean in some places are standing to the depth of kine-feet. After the appearance of the fifth sun, monks, the water in the great ocean is not the measure of a finger-joint. Then at last, after another lapse of time, a sixth sun appears; whereupon this great earth and Sineru, the monarch of mountains, reek and fume and send forth clouds of smoke. Even as a potter's baking, when first besmeared, doth reek and fume and smoke, such is the smoke of earth and mountains when the sixth sun appears. After a last vast interval, a seventh sun appears, and then, monks, this great earth, and Sineru, the monarch of mountains, flare and blaze, and become one mass of flame. And now, from earth and mountains burning and consuming, a spark is carried by the wind and goes as far as the worlds of God; and the peaks of Mount Sineru, burning, consuming, perishing, go down in one vast mass of fire and crumble for an hundred, yea, five hundred leagues. And of this great earth, monks, and Sineru, the monarch of mountains, when consumed and burnt, neither ashes nor soot remains. Just as when ghee or oil is consumed and burnt, monks, neither ashes nor soot remains, so it is with the great earth and Mount Sineru. Thus, monks, impermanent are the constituents of existence, unstable, non-eternal: so much so, that this alone is enough to weary and disgust one with all constituent things and emancipate therefrom. Therefore, monks, do those who deliberate and believe1 say this: 'This earth and Sineru, the monarch of mountains, will be burnt and perish and exist no more,' excepting those who have seen the path. Maitreya said, Master! I have been instructed by you in the whole of the Vedas, and in the institutes of law and of sacred science: through your favour, other men, even though they be my foes, cannot accuse me of having been remiss in the acquirement of knowledge. I am now desirous, oh thou who art profound in piety! To hear from thee, how this world was, and how in future it will be? What is its substance, oh Brahman, and whence proceeded animate and inanimate things? Into what has it been resolved, and into what will its dissolution again occur? How were the elements manifested? Whence proceeded the gods and other beings? What are the situation and extent of the oceans and the mountains, the earth, the sun, and the planets? What are the families of the gods and others, the Menus, the periods called Manwantaras, those termed Kalpas, and their subdivisions, and the four ages: the events that happen at the close of a Kalpa, and the terminations of the several ages 11: the histories, oh great Muni, of the gods, the sages, and kings; and how the Vedas were divided into branches (or schools), after they had been arranged by Vyása: the duties of the Brahmans, and the other tribes, as well as of those who pass through the different orders of life? All these things I wish to hear from you, grandson of Vaśisht́ha. Incline thy thoughts benevolently towards me, that I may, through thy favour, be informed of all I desire to know. 1 Then I saw “a new heaven and a new earth,”[a] for the first heaven and the first earth had passed away, and there was no longer any sea. All of these myths seem to point in the same direction, along with the Law of One text. Together, they paint a picture of a predictable, catastrophic event which occurs at the end of each cycle and acts as a clearing of the Earth's surface so that life is able to reset and continue in a new direction. These myths tell of what is most likely a solar event of some kind with an energetic release of such magnitude that it would change the Earth's axial spin entirely. Wilcock describes how, even if this event happened slowly, it would have major, devastating effects upon the Earth's surface. An event of this magnitude would most likely result in colossal tsunamis as all of the displaced oceans would initially continue to rotate on the Earth's previously established axis. This event would also result in massive earthquakes as the Earth's crust was jolted from the sudden change in rotation. Along with this, multiple volcanoes would likely erupting due to this sudden increase in tectonic friction and pressure. ...But before anyone starts panicking and running for their bomb shelter, they should know that for those on the positive path, there is most likely nothing to worry about. The cultural backgrounds of each of these prophecies are widely various. Yet despite all of the variety, there is still a striking amount of congruency within these texts. Each of these prophecies depicts some type of great cataclysm which would devastate the Earth. At the same time, we see prophecy of a grand renewal of all things. These may seem like contradicting predictions, but there is an explanation to the matter. These prophecies depict a choice between a positive and a negative path. Just as the passages referred to before, there is the choice between service to self and service to others. One path requires a catastrophic event which will balance karma, and allow all souls who experience it to start the next cycle fresh, according to the Law of One. The renewal is, of course, the monumental expansion of life, consciousness, and of our planetary existence as a whole. Taking each of these texts into account, this is a very likely prediction for our near future. One key point to remember for those on the positive path can be found within the Zoroastrian texts. This is the statement, "all men will have to wade through a stream of molten metal which will seem like warm milk to the just". I take this to mean that the experience will be soothing to the virtuous, like warm milk to a baby, but for those on the negative path, it will not be fun. There is one particular set of prophecies which have received more attention in modern times. These are the Hopi prophecies. This series of predictions seemed ro have become more and more evident as the 19th and 20th centuries progressed. In fact, these ancient texts spell out the progression of Western civilization so thoroughly, one may think they were written in modern times. Here is a passage from the Techqua Ikachi (the Hopi Prophecy) from Archive.org. This prophecy goes on to say that the time will come when common people will become concerned and frustrated because they no longer can live with their hectic world. They will be particularly against the bloodthirsty policies and the deceitfulness of the world leaders. The unrest will be world wide as they foresee that the hope of living in peace has become hopeless. The world over the common man will band together to fight for world peace. They will realize that their leaders have failed in accomplishing peace. People in high places will be hunted down like animals, perhaps through terrorism. In turn leaders will retaliate and begin hunting each other. This condition will gather strength and spread far and wide. It will get out of control the world over. Revolution could erupt on our land. The liberators will come in from the west with great force. They will drop down from the sky like rain. They will have no mercy. We must not get on the house tops to watch. They will shake us by our ears, like children who have been bad. This will be the final decisive battle between good and evil. This battle will cleanse the heart of people and restore our mother earth from illness and the wicked will be gotten rid of. The prophets dare say a peaceful new world order will be drawn in Hopiland. The people will live under one God and leader. WE will speak one language, the Hopi. The earth will bloom again. If this fails to materialize our Great Creator through nature will do the task according to their plans. It could be total destruction in any form. Only a brother and sister will survive to begin a new way of life. In my point of view, the accuracy of these ancient predictions pretty impressive. If I didn't know the origin of these words, I might confuse them with the latest intelligence of the defeat of the cabal. Though these texts are often misinterpreted by religious groups who attempt to superimpose their own faiths over them, the predictions within the texts have remained meaningful over the ages. It seems self-evident that many current world leaders care nothing about peace, though they habitually pretend to (at least those outside of the positive Earth Alliance). In light of this carelessness, we the people have taken up the fight for peace ourselves to ensure that peaceful resolution comes to all conflicts in the world. We have become self-reliant and have given up on letting the greedy and irresponsible dictate policy to us. There is one key congruency between these Hopi prophecies and the other ancient stories we have discussed. That is the fact that we have a choice of creating a new way of life that is founded upon peace, freedom, equality, and virtue, or if we do not want this new way of virtue, destruction (or karmic balancing) is in store for us. Considering the multiple sources from which each of the myths and predictions come, it amazes me how similar they are. Even though they come from very different cultures spread throughout eons of time, they still maintain a similar story. This is of an apparent catastrophic event which Plato refers to as a "conflagration" in his work, the Timaeus. In this writing Plato details his account of his ancestor's conversation with the famed Egyptian priests who seemed to have knowledge dating back for longer periods than most were able to at the time. If we were to translate these writings to modern terms, we would have a major solar event which would wipe out life on the Earth. However, this is only the perspective of the cabal themselves. These people have not done their due diligence to learn that the positive path has a much different outcome. Consequently, they only have calamity in their minds. The positive path includes a quantum leap in evolution on the planet. According to the Law of One texts, this event will bring a sort of bifurcation of the human race during which some will ascend to higher consciousness, while others experience the world-ending destruction described in the texts we have examined. Here is the pertaining passage from a the article, Wisdom Teachings: Prepare for Ascension. So as discussed before, at the end of the first 25,000-year cycle, no one ascended, and at the end of the second, cycle, only 150 souls were harvested. Consequently, the planet was clean-swept and afterwards, Earth's 3rd density was opened to all souls who desire further 3rd-density experiences. This brings us to present-day Earth, at the end of our current cycle in 3rd density. We have soon to experience this conflagration/confluence of energy and the consequent bifurcation of time-lines. The Law of One describes this process as a sort of three-way split. As discussed before, we have the souls who do not graduate leaving the Earth and relocating on a distant, 3rd -density planet so that they can complete their 3rd -density experience and hopefully graduate afterward. At the same time, we have those who have chosen the negative path experiencing the karmic balancing destruction of conflagration. This passage also describes what occurs for those on the positive/service-to-others path. Those on this path, somehow, do not experience this coming destruction for 3rd density. According to the text, these souls will be transported to a higher plane of existence. It is interesting, I think, to imagine the Earth as barren and desolate on the 3rd density, and yet on higher planes it is lush and rich with numerous and various forms of life. One might be afraid of such an event as this conflagration if 3rd density was their only option, or if they were on the dark path, but the prospect of the path of light seems extremely promising in my opinion. Once again, the congruency seems clear. The paths are set, though each of us has our own choice as to which one we take. This concept has a good amount of detail to it, and I would recommend anyone who feels the desire to read more on it within the Law of One texts, as these can be very descriptive and free from the religious overtones some of the others texts may have. The news that we have successfully thwarted this partial disclosure narrative is very good news, in my opinion. However, this does not mean that we are done. There is still significant effort to be made for the sake of Full Disclosure, and ascension. This news of success is proof that we can make a difference. It doesn't even take the entire planet to turn to the tide, but with enough of us doing all that we can, the job will get done. It should be known though that the more people we have setting ego aside and fighting for the truth, the faster this world will be transformed. It won't take that long if we all do our part. I task each of us to get involved. If you find articles such as this, and those mentioned within it helpful, share them on social media. If we truly believe in change and our ability to create a better world, we will act upon that belief. Anyone and everyone who is willing, lets get it done, and next time the good news comes forward, we may not even need to hear it because we will be seeing it everywhere. Here's to change, growth, expansion, and ascension. Thank you Shem for putting this together. It was nice to see bits of all the information put together so it flowed in a way that was easy to read and understand. From the above article, you write: "(One point to note... When the Law of One texts uses the phrase, "walk among", they are often referring to mating with Earth people, and mixing their genetics for the purpose of assisting the Earth population to advance further energetically.)" Could you please share how you know that Ra is "often referring to mating with Earth people"? What gives you this idea? It's in 18.14 and 18.15. They explain the phrase a little better in this section. The text could also be referring to genetic engineering, but the it does uses the wording, "a contact of the nature you know as sexual". Here is the URL. I'll probably create a link as well. I worry about Corey !, For he and I are going through physical changes his quicker...he's tried to expoain he's changes but it was ??? at least I felt his truth coming out as usual but not clarified clearly. Mine has been alot of years of false Rx and body for long time resestent to insulins among others, just signs but painful over years of use, many combinations is acurring. Take best care Corey whiplashes from cabal I've been told is approaching . when we're done, Mr O'Curran, your body metabolism will change, and you will have become resistant to all diseases. Yes Joy, It's now I'm dealing with,theres no getting around that physicality of injuries on bodies happens, I'm one using all important help to cure and get ready ! Note: I'm so glad that the author has taken charge responsible for after publishings,refreshing. The disinformation has begun I will not feed into their negativity. Everything that you write about is truly fascinating and I have always known deep down that we have been deceived and lied to from the very beginning because of the horrible deceitful corruption that exists. The good will prevail in the end . My mom always says to me Patience is a virtue . Joseph,think back at lower grades...why was history teachers so mean along with gym teachers,during my area of time Viet Nam , I was told it was prepping for war they also were racists challengingly one culture between another,actually laying hands-on youth.it was in California. Did you ever witness similar atrocity's? Allow me to tell you the version that I saw in my contemplation/meditation..
the bad guys are ascending with us. When we get to that point of this EVENT, They already have returned to ONENESS, in other parallel Earth Timelines. They are NO LONGER bad guys. The WHOLE ensouled HUMAN RACE will ascend together. Our harvest is 100%. The WHOLE 3rd DIMENSION is going to COLLAPSE. We are all going to metamorphose into our LIGHTBODIES while 3D is collapsing and when we are done, we will no longer be human. We will live as LiGHTBODY crystalline,silicone) beings in the Upper 4th DImension. Da 1000 years of Peace and Prosperity will begin. ALL-THAT-IS, SOURCE, PRIME CREATOR, is in-charge. NOT ANY GROUP OF ETs. SOURCE, misnamed WAVE X,...as we speak, is streaming down to our solar system thru these massive coronal holes(actually SUN PORTALS) When this superconscious Energy PRIME Creator Being has enfolded our Earth, electromagnetic frequency including the magnetosphere and gravity ,.. will dissipate. The EVENT is the 3DAYS OF DARkNESS INSIDE THE NULL ZONE. Here, the sun will be blotted out, accompanied by intense cold, and lightning called WAVE INTERFERENCE. This lightning will erase every blockaging frequencies , that has kept us imprisoned here. This Lightning and Pure Darkness, which is SOURCE, PRIME CREATOR,.... will activate the EArth and humanity's lightbody while we hibernate for a few days.. When we wake up, our metabolism will have changed, we breathe in PRANA from our CROWN, we take in PRANA from our AXIOTONAL lines, our Psychic abilities and Avatar abilities are now on-line.....and the EARTH..........she's breathtakingly beautiful. All the stars that you see,...from here on,...are also inside upper 4th Dimensional. THEY TOO HAVE METAMORPHOSED. THIS iS CALLED THE INBREATH OF CREATION. This is our first step towards ONENESS. When will this happen..? We're on top of it. Time as we know it is dissolving as well, so , ..the best guess is probably end of this year. I hope so. as we are all tired and ragged from all these dramas. although , the highest truth would be......that THERE IS NO PAST, NO FUTURE and that ALL LIFETIMES AND EVENTS are happening in the NOW, even the BIG BANG. There was an article yesterday, about a group of scientists planning to create an AI with ethical and moral programs. Many bloggers disagreed thought it could not be done , but hey,....this is already done. Al Bielek, timetravelled to 28th century where the humans are enjoying a society run by AI with these programs. This project was designed by the WINGMAKERS. Also there are many timetravellers who could move back and forth,..in what we presume to be PAST or FUTURE, like ALBERTO CAMOSA, and JOHN TITOR. My point is,...after long deliberations, that if the 3rd Dimension is going to fold, and that THERE IS NO 3D ALTERNATE REALITY for them to go on playing,... what are the chances that these bad guys have already gone in what we assume to be future timelines and went on, evolved,.. to become one with SOURCE. That is the only feasible solution. Maybe, it would be easier to accept this ASCENSION MODEL if we know that the bad guys are US, and we are THEM, or that somehow, they are our beloveds. have to work on how to balance the energies I used. Which is where I am . I have not intended to attack anyone. What I shared was another info on this subject. i did mot think that what i shared info was negative. No Joy, you must of missed the crummy statements, beforehand the author has removed the nasty's etc. You and I on Same page agreements. No I did not miss those. Am glad they were deleted. Henrique,.. am not familiar with Corey, nor Ra's law of the ONE. although there are many claims that the fabled city of SHANGriLA and SHAMBALLAH are indeed in the inner earth, in upper 4th dimension. whewwww...it's a jungle out there. Our next stop after 1000 to 1200 years (more or less) would be 5th DIMENSION During our ascension to 5D,our semi-etheric physical, mental, emotional body will metamorphose into the double-tetrahedron MERKABAH. Earthmother is the STAR-ascendee to 5D and we are her honor guards. I know that there re 5 different kinds of sacred geometric MERKABAHs that we will metamorphose into before we become NON-DUAL,but that info is not useful to us here. Oh,brother!!!!Beware.. see you on the next planet. those negative comments were INTENTIONALly spiked with harmful energies, most probably done by the cabal thru their tentacles.. the CIA/DARPA, or..?... with the main purpose of lowering and scattering our consciousnes while we share info. again, thanks to ADMIN for removing them.